Could your shore power be a disaster-in-waiting? Boat buyers often take strong positions on galley stoves, insisting that they would never expose themselves to the risks of an explosion posed by propane. 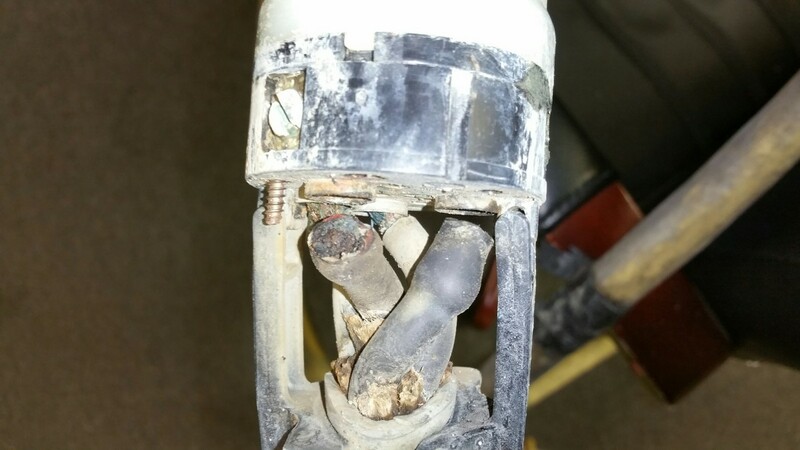 A propane explosion seems much riskier than plugging in a shore power cord. But which is more dangerous? Before we answer that question, let’s look at the ubiquitous shore power cord. We treat electrical connections on our boats with great care, vigilantly crimping ring terminals onto wire ends and connecting them with machine screws or nuts onto studs. In addition, we secure all wires to minimize movement, and we make sure we keep all connections away from salt water. In some cases we apply coatings to minimize oxidation and corrosion. We handle all connections that way, with one notable exception:the shore power cord. Instead of ring terminals and fasteners, we rely upon friction between contacts. We leave the cable free to move around as the tide changes and as the boat rolls, and we make the connection outside, exposed to the weather. It sounds like an invitation to disaster, and unfortunately disaster sometimes ensues. 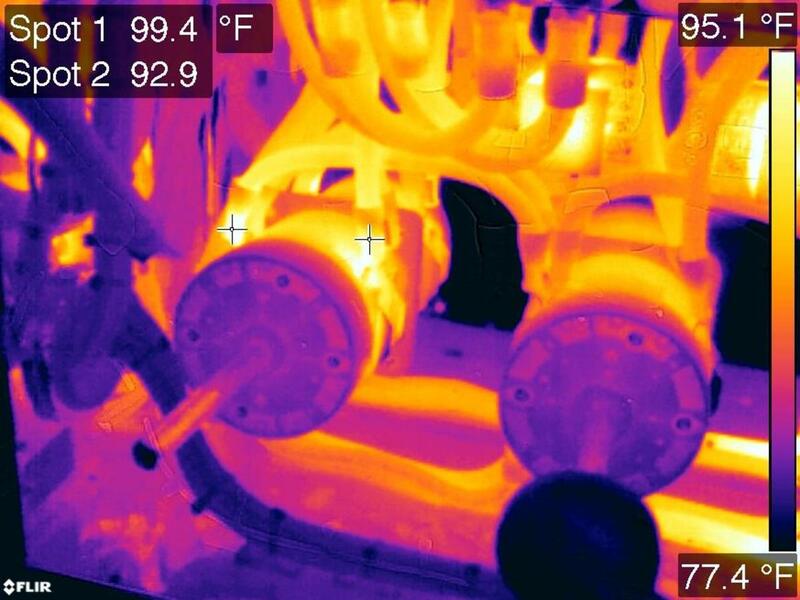 Here’s why we pay so much attention to reliable electrical connections—poor contacts result in increased resistance and as current flows through resistance it generates heat. Create enough heat and a fire will ignite. You might be wondering, “but won’t my circuit breaker trip and prevent a fire?” The answer is no. The high resistance will not increase the amperage to trip the breaker. In almost all cases, your circuit breakers (over-current protection) have a single purpose—protect the wire against excessive amperage and shorts, not necessarily the devices supplied by the wire. In one case a faulty shore power connection led to a fire that destroyed a 44-foot powerboat. Only 12 amps were flowing through the cord at the time the fire started. 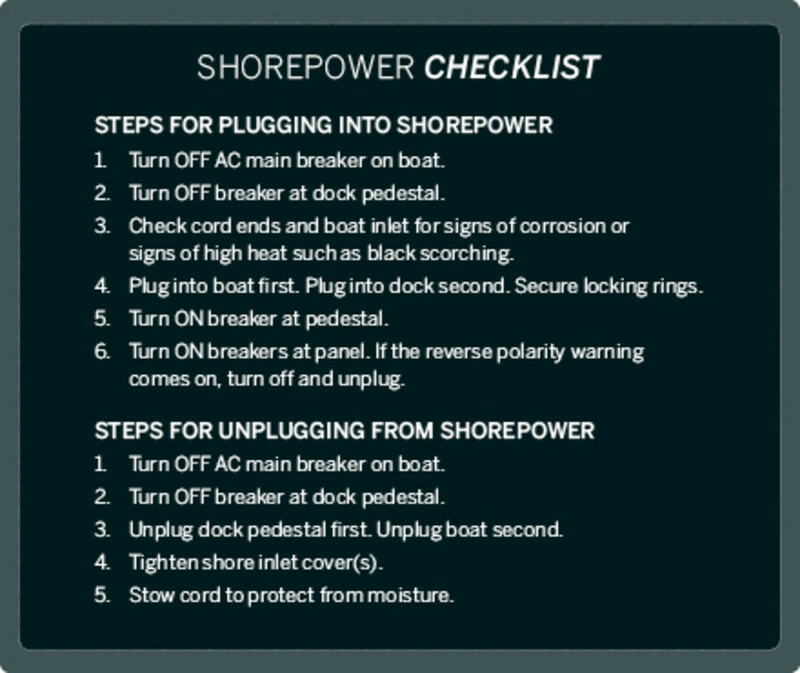 The breakers will protect the cord (unless the cord itself has been damaged), but not the shore power inlet attached to your boat, or the surrounding boat structure. 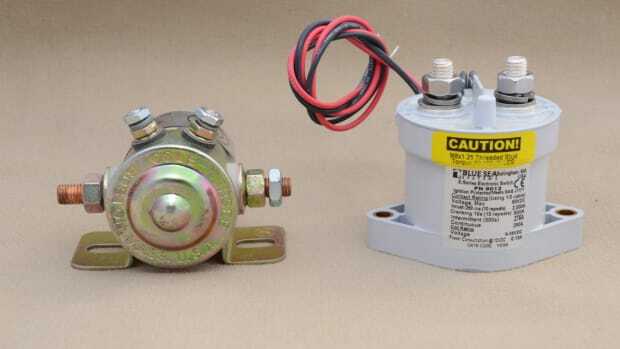 High resistance at this connection will result in excessive temperatures, in some cases high enough to create ignition, and in many cases enough to burn a boat to the waterline. High resistance at the shore power inlet can be attributed to three factors: wear, pitting, and corrosion. Understanding the causes can help you avoid failures, so let’s begin with wear. Most plugs rely on spring tension to maintain a good contact. The amount of surface area contact on a shore power connection is remarkably small (see photo). At home, once you plug in the refrigerator, it likely stays plugged in for many years, but on your boat, you plug and unplug every time you go out. 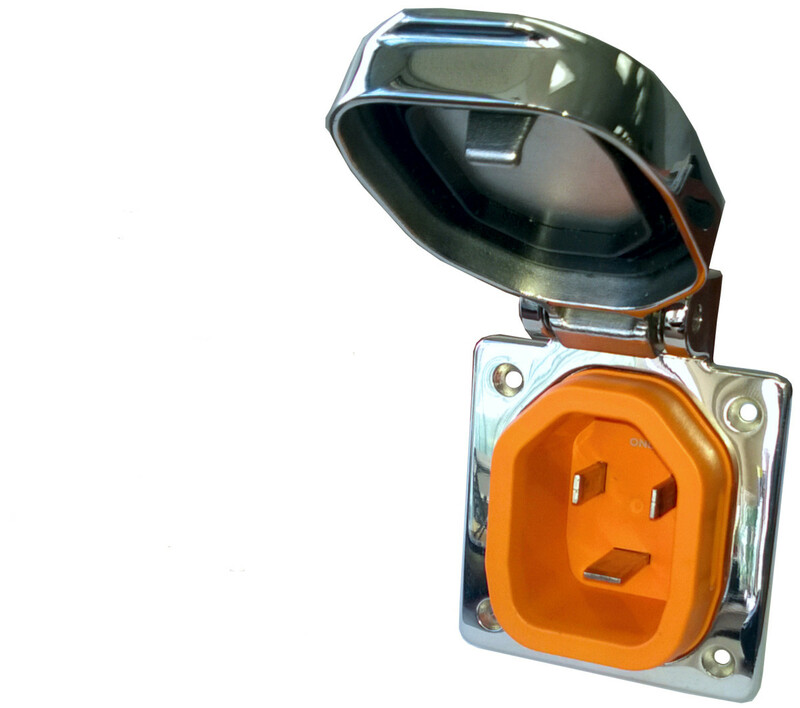 Additionally, traditional style shore power plugs must rotate in order to make the connection, adding to the friction and wear from each use. If the connection can flex and move a bit, the wear accelerates. While you cannot reduce the number of times you plug in, you can minimize the associated wear by tightening the locking ring every time you plug in and by securing the cable to minimize flex at the inlet. Arcing refers to electrical current that makes the “jump” through air between two contacts before they touch or after they separate. Arcing generates a burst of tremendous heat—high enough to melt metal. The molten metal creates pitting of the contacts, which in turn increases resistance. Arcing occurs when a connection is made while a load is present, and even more so when a connection is interrupted with a current present. For this reason before you plug in or unplug, all AC circuits should be turned off. The absence of current will eliminate arcing. Corrosion also increases resistance. 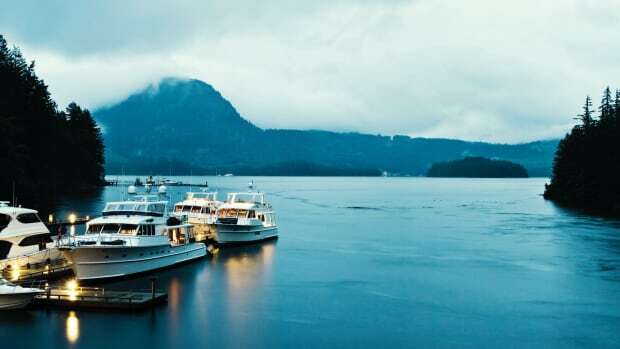 For our shore power connection, corrosion can attack the inlet contacts, the wire ends, and the terminals that connect the wires to the cord ends. Exposure to salt and water accelerates corrosion. The shore power inlet on the cabin side or in the cockpit has a hinged cover, which must be secured to minimize water intrusion. 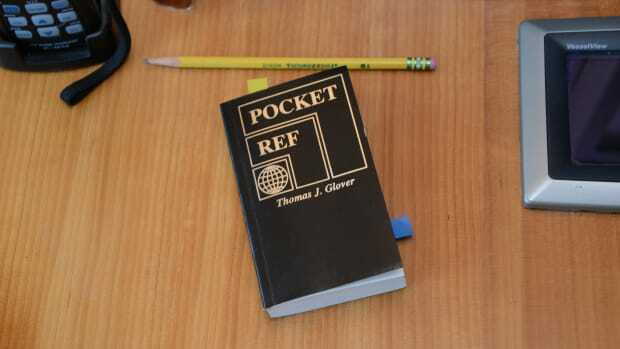 Most have a rubber gasket inside the cover—make sure it is in good condition. Leaving a shore power cord coiled on deck while underway will guarantee accelerated corrosion. On most shore power components the metal prongs and receptacles consist of nickel plated brass. The nickel protects the corrosion-prone brass, but over time the abrasion from plugging in wears away the nickel, allowing corrosion to accelerate. If the contacts show yellow or gold instead of nickel, it is time to replace the hardware. Corrosion increases resistance and must be avoided. Corrosion on any part of the shore power chain of connections must be addressed: the cord ends, the exposed portion of the inlet, and the backside of the inlet where the wires attach. Finally, the condition of the shore power cable itself must be monitored. A cord that has been pinched against the dock or severely crimped probably has broken strands. With fewer continuous strands, the wire size has effectively been reduced. Under high loads the cable might overheat and melt without tripping the breaker, which is rated for the original conductivity of the cord. Also, a cable end that has been dropped into salt water runs a higher risk of corrosion. If this happens to you, disconnect both ends and flush the exposed end with fresh water. After it dries, apply a corrosion blocking spray and keep a close eye on the condition. 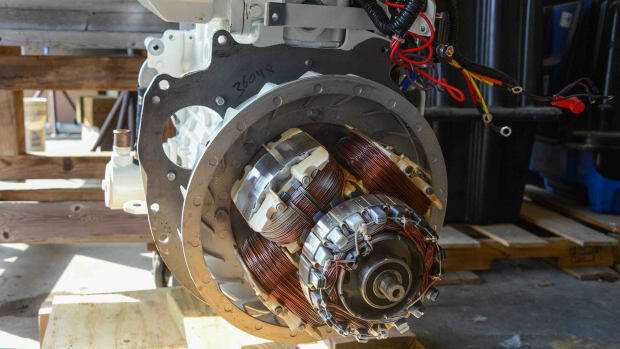 Given the critical nature of the shore power connection and the risk of fire, you might be wondering if there isn’t a better way. 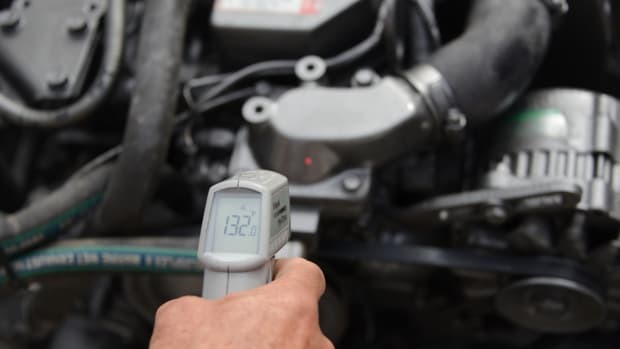 Most, if not all, of the failures described above can be avoided by following the basic guidelines and visually monitoring the condition of the components. The standard 30- and 50-amp plug design was introduced by Hubbell Marine in the late 1950s and has been in use for more than half a century. The design works well when properly utilized and maintained. Nonetheless, SmartPlug Systems, based in Seattle, Washington, redesigned the shore power connection in order to minimize the risks of incorrect usage. By eliminating the traditional twisting requirement, SmartPlug® can utilize flat straight blade connections. Although spring tension still makes the contact, the contact surface itself exceeds the traditional style by a factor of 20. The physical shape of the connector means that it can only fit one way, eliminating the need to locate and line up the locking tab. Protection from moisture has also been improved and the locking mechanism is simple and leaves no doubt when it is secure. SmartPlug® can also be retrofitted onto existing cords, but you will need to replace the shore power inlet mounted on your boat. Even with SmartPlug® installed on the boat, you will still be using a traditional twist-lock type on the dock pedestal. Let’s return to the propane stove versus shore power cord comparison. According to research conducted by BoatUS, propane stoves account for less than 1 percent of all fires on inboard-powered boats. In contrast, A/C electrical failures account for 17 percent of all fires and most of these fires start somewhere in the shore power connection. So why do we fear propane stoves and take a casual attitude toward shore power cords? Regardless of the stove you choose, give the shore power connections the attention they deserve. And after you cook, make sure you clean that cutting board properly. 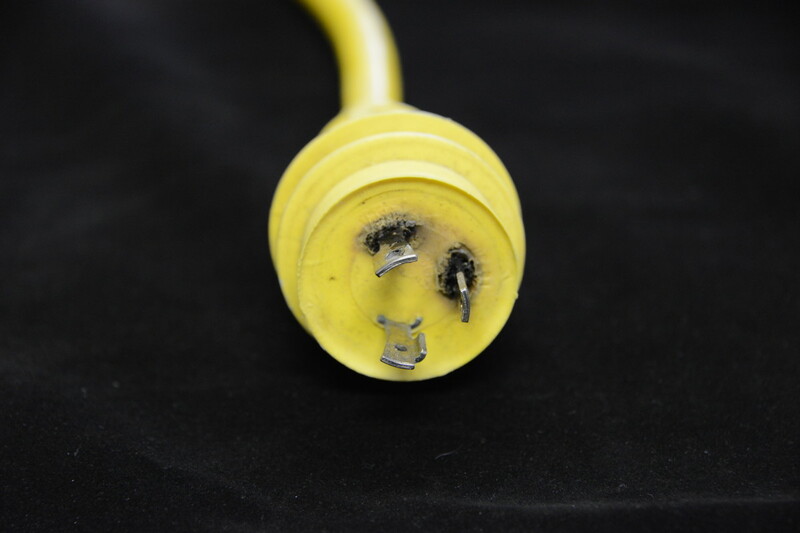 Overheated Plug:An all too common sight—this plug has been damaged by high temperatures from high resistance in the connection. Once damaged in this way, the connector must be replaced. Burnt Cord:Extensive corrosion from seawater exposure combined with high heat has taken its toll on this shore power connector, rendering it useless at best, and a serious fire hazard at worst. SmartPlug:SmartPlug&apos;s redesigned shore power connection that minimizes incorrect usage by removing the twist to lock in favor of snapping the plug together.